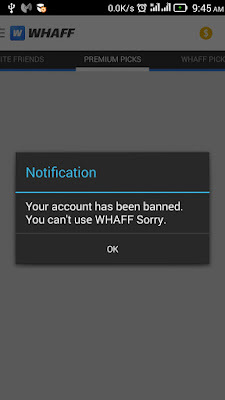 1- After you download whaff from google play store and installed it in your Android device, open and log in to whaff. 2- Uses your Facebook ID and password, don’t worry your personal information will remained secret and save. After successful login you will be prompt to insert the invitation code. 3- Use this code AC52519 and you will get the welcome bonus, if you do not use the Whaff Invitation Code CO37963 your first balance still 0.20$, but if you use that code you will get some amount of dollars into your balance and I will receive the same amount as you too. 3- Yes it is a reward that I have told you about how to earn money with Whaff and you get reward by using the invitation code from me. Start Earning Premium Picks Here you can do the task of Downloading the applications, then run it, remember to not uninstall it until the task end because you will get the rewards too. 4- Run the Applications through Whaff daily and get the money. Whaff Picks Here lot of Downloading task, download all application and run it through Whaff you will get the money. But some of those applications only support in certain country only, but don’t worry there are still lot off applications to be downloaded. In Whaff Picks you can invite your Facebook friends to earn $0.01 for one friend, you can also invite all choice to earn $0.10, but my suggestion is do not use Invite all choice, just invite one by one even if it only earn you small amount per persons and you are limited to invite only 50 persons a day.Other Picks In this Category you can find a lot of task you can do to earn more money, but some times I didn’t get my credit for doing some of task here. 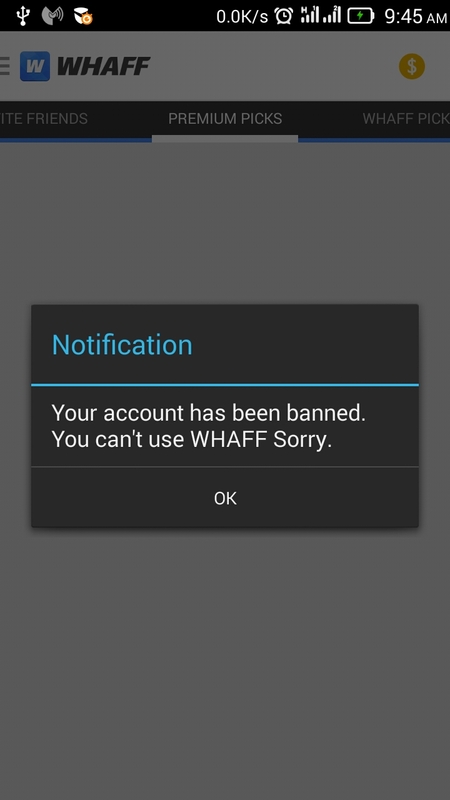 Whaff should fix this error. Lucky Picks You can get lucky rewards if you luck by participating here. I never doing task here, I don’t like of risking my luck so I don’t do task in Lucky Picks. Browse Get your Invitation code here by clicking “Friends Invite”, copy the code and share to your friend. You and your friend will get the same amount of rewards. 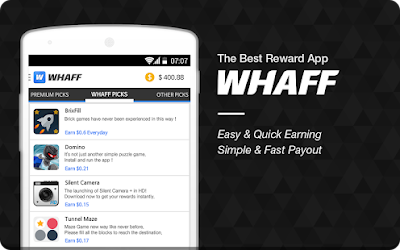 Rate Whaff in Google Play store and like their Facebook Fan Page through Whaff Application to get rewards. When your balance reach $10.5 you can exchange with Gift Cards like Amazone Gift Card, Playstation Store Gift Cards, Xbox Live Gift Card, Google Play GiftCards, Steam Giftcard and Facebook GiftCard. You can also send you balance to your PayPal. good luck for all and take care please.